Now in paperback—Michelle and Jim Bob Duggar share the joys and challenges of parenting with faith. Anyone who sees America’s best-known mega family on television is filled with curiosity. People want to know….Why do they have so many children? What do they believe? What does the family do for fun? How do they get their children to obey so well? How can they afford to live? Now, Michelle and Jim Bob show how parents can succeed whether they’re rearing a single child or several. 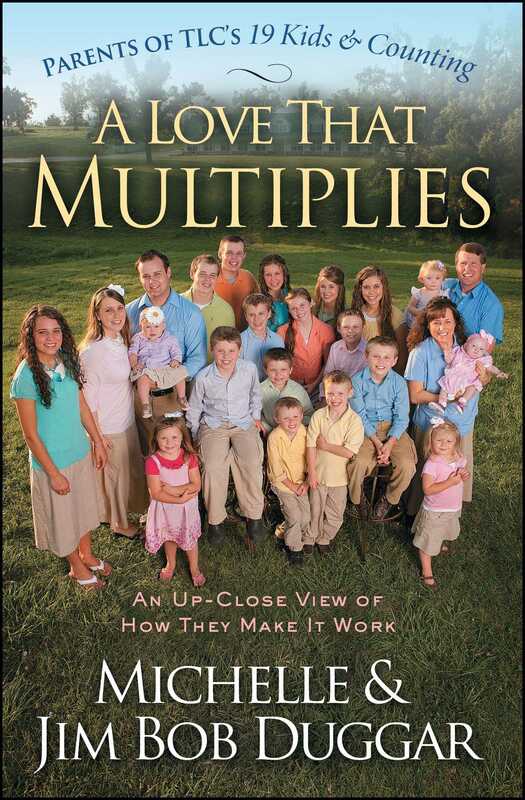 In this second book from the Duggars, they explain the principles that equip their family to face life’s realities—including their most recent hardship with the three-month premature birth of their newest child, Josie. Josie’s birth tested everything the family believed in and demonstrates how they worked together, relying on their faith. They also discuss helping their older children navigate decisions about courtship and marriage and how to prepare to be productive adults. As the Duggars share their hearts and faith, readers will find answers to their many questions about this inspirational family. We believe that children are a blessing from God, and twenty-two years ago, in the fifth year of our marriage, we decided to let Him decide how big our family would be. By early 2009, He had given us eight daughters and ten sons—eighteen wonderful children—and an amazing life filled with enduring love, incredible joy, and fun-filled adventure. We were amazed at how God had entrusted us with so many blessings. Sure, there were challenges along the way. We had endured some very stressful times in our marriage, when feeble income and overwhelming work and responsibilities had threatened to tear apart our dreams for our family. And we had suffered hard losses, including the death of Michelle’s mother. But with faith and prayer we had survived all those difficult times, and as 2009 began, we felt confident that nothing could ever shake our relationship with God or with each other. We never dreamed that by the time 2009 ended, we would find ourselves living in a whirlwind of fear, anxiety, and turmoil. Now, a year after the overwhelming challenge that turned our lives upside down, we’re writing this book to share what we’ve learned from the experience and also to share how our faith in God and the Bible principles we live by have sustained and guided us through a traumatic season of our lives, one that may not be over yet. Sometimes they go on to say that they don’t share any of our beliefs and they think our parenting practices are outdated, narrow-minded, misguided, ridiculous, and a host of other adjectives, some of them too harsh to print here. And yet the majority of the letters—even from those whose beliefs are different from ours—also tell us that they like the end product of what we do and believe: a close-knit, love-filled family bustling with well-behaved, respectful, fun-loving, adventurous, and smart children who cherish their parents and siblings and show courtesy and kindness to those they meet. One of the most frequent comments was that we’d never experienced “real life,” with all its hardships, challenges, setbacks, and pain. The truth was, we’d been through plenty of hard experiences, but none as difficult as those we’ve experienced in the last two years. In this book we hope to communicate how the faith and principles that guided us through all the good times have kept us strong through the bad times too. Our hope is that through our story you’ll find ideas for enriching your own family’s life together, building love, joy, wisdom, and strength that will see you through good times and bad. We’re not parenting experts. We don’t have all the answers; we’re still learning every day. These are just the guidelines we follow, the practices that work for us. Since we’re unable to respond to the hundreds of daily inquiries that come to us, we hope this book will provide answers and insights that will not only answer your questions about the Duggars but will also inspire you to look for ways to become the best possible parent and role model to your own children. As we write, our family’s life seems to have returned to something like normal after experiencing events that turned our world upside down. But we are different people now than we were when 2009 began. We’ve experienced firsthand how quickly and cataclysmically everything can change, and now we value even more the beliefs and principles that sustained us through our ordeal—not only in matters of faith and of the heart but also of the home. In the chapters to come we’ll share how our parenting methods worked, failed, or evolved under duress. In reading about our experiences, perhaps you’ll find ideas for developing your own household systems for managing things like schedules and organization. As you learn about our child-rearing practices, maybe you’ll gain insights about how to shape your own children’s hearts and minds lovingly and effectively. Our primary goal in this book is to encourage you to recognize the God-given blessings in your own life and help you find ways to fill your family with everyday joy as well as lay a foundation of faith that will sustain you through difficult times. In short, we want to help you find ways to infuse your family with faith, fun, and hope for a bright future. During our nearly twenty-seven years of marriage, God has given us constant joy through our big, expanding family; but to keep life interesting, He’s also sent plenty of challenges our way. For example, in our first book, we described how we coped with having five children under age five when we lived in a nine-hundred-square-foot home that was also the sales office for our used-car business. Now we live in a seven-thousand-square-foot home, but we still live frugally, and we still encounter challenges, as well as joy, on a daily basis. We finished our first book in October 2008, when our joy about the marriage of our firstborn child, Josh, to the delightful Anna Keller was tempered by the sober awareness that my (Jim Bob’s) dad, J. L. Duggar, had been diagnosed with a terminal illness, an advancing brain tumor. When we built our home in northwest Arkansas (a nearly four-year family project completed in 2006), we intentionally included a handicap-accessible living area for family members who might need our assistance as they coped with health issues. Shortly after we moved into the house, that guest area had been put to good use by Michelle’s dad when he lived with us following a terrible car crash with a drug-impaired driver. He stayed a year and then moved back home to Ohio to live with Michelle’s siblings, leaving the guest area ready for the next time it was needed. A few months later, my dad was diagnosed with a medullo-blastoma—a brain tumor. This stage of our lives began one day when Dad felt a little knot on the back of his head. He thought at first it was a bug bite, but when the “bite” got bigger instead of going away, he went to a dermatologist, who sent him to another specialist, who sent him to another specialist, until finally the tumor was identified. The doctor who diagnosed the problem told us he’d never seen anyone survive past about age fifty with that kind of tumor. Dad was seventy-one when he was diagnosed. His doctors said the tumor had started in his brain and had eaten through his skull to protrude out the back of his head, causing the bump. One surgery was performed, but the surgeons said they couldn’t remove the entire tumor without causing brain damage. Dad chose not to go through chemotherapy and radiation; he wanted to avoid the side effects of those treatments so he could enjoy being with his family and especially his grandchildren during the remainder of his days here on earth. Our kids love celebrating our family’s special days together, including Grandma and Grandpa Duggar’s forty-eighth wedding anniversary. For a while Dad’s overall health held steady, but gradually his condition began deteriorating. We welcomed him and Mom into our guest room, and while Mom insisted on providing almost all of Dad’s daily care and devotedly worked to preserve his dignity, our children loved having them there to play games, listen to stories, go on outings, and share meals with us. It was truly a joy to have my parents living with us, even though it was hard on all of us to see Dad’s health steadily fail over the next eighteen months. Mom put him on a special diet that she credits with prolonging his life and keeping him active for much longer than anyone expected. In addition, a wonderful physician friend, Dr. Doty Murphy, came to our home frequently to manage the IV treatments that kept him from getting dehydrated. Dad remained active, but nothing could stop the inevitable growth of the tumor. When it extended into the part of the brain controlling motor skills, the change seemed to happen overnight. One day Dad was at the park with Grandma and the kids. The next day he could no longer stand or feed himself. By January 2009, Dad was unable to speak. But he remained an important part of our family; we visited his bedside often, and whenever he felt up to it, we wheeled him out to the living room or to the dining table to join us for family time. The kids interacted with him whenever he felt like coming out. They would sit and carry on conversations with him, even though he couldn’t respond, telling him about their music lessons or the new phonics sounds they were learning or some funny thing one of them had seen or done. Then a major ice storm struck our area, possibly the worst in northwest Arkansas history. Many homes and vehicles were damaged or destroyed by falling trees. Without power, businesses couldn’t open. Schools were closed. The governor declared our area a disaster area, and residents struggled to recover from an estimated seventy-seven million dollars’ worth of damage. Our yard turned into a giant ice rink (a wonderful thing, our middle six boys would tell you, when they were allowed to go out), and throughout the region ice-crusted power lines either fell on their own or were brought down by ice-coated trees falling on them. Huge limbs from the massive shade trees in our yard broke off and fell to the ground, littering our lawn with gigantic ice sculptures. Roads were closed, and simply being outside was hazardous, with trees or limbs constantly falling and power lines dangling or already on the ground. But our devoted film crew, which for several months had been videotaping our family for the TLC reality series, called to say they were heading our way, determined to capture the Duggar family’s reaction to the weather-induced woes and wonder. That was a blessing for us because just as the power went out and trees started falling, Michelle realized we were running short of diapers. She called associate producer David Felter and asked if he could pick up some diapers on the way. David, a single guy who’d never been anywhere near a discount store’s baby department, gamely made the purchase and headed our way with producer Sean Overbeeke. They drove around a ROAD CLOSED sign only to end up in a ditch a little later. Passing firefighters pulled them out and set them on their way again, and eventually they slid down our driveway, delivered the diapers, and started filming. To our younger kids, having the power go out was a grand adventure. Our family almost never watches broadcast TV, so nobody missed that at all, and if you’re a little boy with a bunch of younger brothers, what can be more fun than having to use the bathroom by flashlight? The kids were excused from doing most of their schoolwork because there was no power to run the computers, and they found creative ways of entertaining themselves, as always, whether it was Rollerblading through the living room or conducting circus acts such as balancing a stick horse on their noses. On the other hand, to Michelle, the mother of a newborn (our eighteenth child, Jordyn Grace, had been born about a month earlier, on December 18, 2008) as well as the sixteen other children then living at home, having no electricity wasn’t all that wonderful. Exciting, yes, just not the ideal. And this wasn’t just a short little power outage. No, power was out throughout our region, and at the Duggar home, for nine long days! Thankfully, I (Michelle) am married to a creative and smart husband who’s also a devoted father. He knew that lots of little eyes were watching how he would cope with the ice-storm disaster, and his optimism and good humor never waned throughout that long, difficult time. Jim Bob rarely gets rattled; he’s always rock solid in his beliefs and in working toward the parenting goals we have set for ourselves. He looks at everything as an opportunity to teach our children something new. The ice storm was no exception. We hold to the truths of the Bible, in which the apostle Paul wrote, “I have learned, in whatsoever state I am, therewith to be content” (Philippians 4:11). How could we teach our children those words and then show frustration, fear, anger, or some other destructive emotion when an ice storm made our lives a little more complicated? Seeing the vast amounts of damage to the trees in our yard, Jim Bob might have had a few moments when he felt completely overwhelmed, wondering, How am I going to get this huge mess cleaned up? What if the power stays off for several days? How can I get my family through this calamity? But those little eyes watching him never saw him hesitate. Instead they saw him thank God that everyone was safe, fed, and relatively warm, and then ask Him for strength and wisdom to meet the challenge. And through it all, the smile on his face and the love sparkling in his eyes never faded. However, one thing did change. There have been very few times when Jim Bob has done anything without one or two kids in tow, especially work outside, but on that first icy morning he told everyone to stay put while he cautiously stepped out onto the frozen yard to assess the damage. What he saw was breathtaking. Everywhere he looked, the ground was covered with frozen trees, limbs, and power lines creating a massive, impenetrable thicket of ice. Normally, our home would at least have had radiant floor heat, thanks to the nine thousand feet of Vanguard PEX pipe embedded under the floor tile that was connected to our outdoor wood-burning furnace, but a few days earlier, a part on that system had malfunctioned and we were still waiting for its replacement when the ice storm struck. With no electricity to power the forced-air fans on either the wood-fueled or natural-gas furnaces, our house was quickly growing cold. That situation would have been stressful enough under ordinary conditions, but we had a sick, bedridden grandfather and a newborn baby to think of, in addition to the twenty-one other family members living in our house (ourselves and Grandma Duggar plus our sixteen other living-at-home children, in addition to Josh and Anna, who fled their frozen home in town to seek refuge with us). We were all looking to Jim Bob to figure out how we would survive this trial, knowing that he was relying on the One who had all the answers. Thus we moved through the icy day with a sense of adventure rather than fear. Later that first morning Jim Bob made another trip outside, carefully maneuvering over the ice to the storage shed in our backyard. He retrieved a small generator and fired it up on the front porch to operate the furnace fans, which brought a little relief from the steadily increasing cold. But he quickly realized we would need more fuel to keep the generator running—it had to be refilled about every ninety minutes—so he asked Josh and our next-oldest son, John-David, to try to get to town to buy gasoline. They were gone several hours, not only because they had to drive so slowly on the ice, even in a four-wheel-drive truck, but also because so few service stations were open. Power was out everywhere, which meant that only stations with generators could operate their pumps. It took them a long time to find one that was open. The weight of the ice caused dozens of trees to fall on our property. While they were gone, we looked out the windows and watched in amazement as frozen limbs fell minute by minute and splintered trees covered our property—and stared at the utility pole leaning precariously in our backyard, the broken line coming out of the box dangling ominously in midair. Then, while some of the children watched, a huge tree fell on the storage shed where the generator had been stored, totally crushing it. When he saw the destroyed building he’d just entered a short while earlier, Jim Bob’s mood momentarily changed. He sat the children down at our long dining table and earnestly explained how dangerous their outside world had suddenly become. No one, he said, was to step foot outside until he gave the okay—and that might be several days away. “Just like that tree that fell squashed the shed, a tree or limb could fall and squash you. I love y’all, and I don’t want anyone to get hurt, so no one goes outside until I say so,” he said, his eyes focusing on each child in turn and waiting for an acknowledgment. One day passed and then another. We normally do eight to eleven loads of laundry a day, and by day three, with none of our four washers and four dryers running, the mountain of dirty clothes in our laundry room threatened to equal the mountain of ice-covered debris outside our house. Then Jim Bob had a brilliant idea. He carefully walked, slid, and skidded his way over the ice field to the shop building several hundred yards away where we park our bus. Ever so slowly, he navigated the giant vehicle up and down the hills in our driveway and cautiously pulled it up next to our frozen-over house. He turned on the bus’s generator and plugged in some electrical cords, and in what seemed like a wonderful miracle, we were able to power one washer, one dryer, two furnace fans, and several strings of low-wattage LED Christmas lights to provide some nighttime illumination. Our home filled with a web of electric cords snaking along the floors and stairs. It still wasn’t easy to catch up with the forty loads of laundry that had accumulated and then keep up with the ever-growing pile of dirty clothes, but by running the single washer and dryer constantly we made progress, slowly but surely. The outdoor temperatures were so cold we simply lifted the garage door on our home’s massive pantry (the space that would be an ordinary garage in other homes is a pantry in ours) so that the food in our three large chest freezers stayed frozen. Fortunately we still had water, and our cooktops and ovens run on gas, so we could still cook. We thanked God for His blessings and His protection during the ice storm, and we asked Him to keep us strong and hold us close during the difficulties we knew were coming: not just during the complications from the ice storm but also Grandpa Duggar’s declining health. Dr. Murphy faithfully continued to come to our home to check on Grandpa and set up his IVs, despite the icy conditions. On one of those cold, hard days, he warned us that Grandpa was failing fast and might have less than a month left to live. On the second day of a major ice storm, our baby, Jordyn, had to be hospitalized due to a respiratory problem. In this photo, Jordyn is about one year old. About that same time we worriedly noticed that Grandpa wasn’t the only one having health problems. Our six-week-old baby, Jordyn Grace, had what first seemed like nothing more than a runny nose for a day; we assumed she’d been infected with the same minor cold symptoms that had passed through the rest of the children a few days earlier. But when you’re just a month old, a minor cold can progress into a serious respiratory problem in the blink of an eye, and that’s what happened to Jordyn. On the second day of the ice storm, her minor symptoms suddenly evolved into a struggle to breathe. A woman who’s mothered eighteen children recognizes when one of her little ones is in distress, and that evening, I (Michelle) knew it was time to head for the emergency room. When doctors at the hospital in Springdale said Jordyn needed to be admitted for observation and respiratory treatments we couldn’t provide at home, especially since we had only limited power provided by the generators, we both stayed with her. Jordyn was struggling to breathe, and we didn’t feel comfortable having just one of us stay with her; with two of us there, one could attend to Jordyn while the other slept or grabbed a bite to eat. We often rely on “tag-team” parenting when things get too difficult for one parent to handle alone. So we called home and made arrangements with the older children and with Grandma Duggar, who quickly offered to step into the supervisory role (no wonder our children long ago nicknamed her Super Grandma!). While her main focus would be tending to Grandpa Duggar’s needs, she would be there to support our older children as they kept the household running. A few days later, while driving through the winter wonderland to return home after Jordyn was discharged, one of our older kids called with a brilliant idea. Since many of the roads were impassable and we were holed up in a giant igloo with limited power and a horde of little kids who couldn’t play outside, they suggested that we invite our friends Gil and Kelly Bates and their seventeen children to come visit from Tennessee! We quickly agreed. And no, we hadn’t completely lost our minds. You see, the Bateses are another huge family who share our conservative Christian beliefs and parenting philosophies, and they’re among our very closest friends. Best of all, they own a tree-trimming service! They took us up on our offer and arrived a few days later, when the roads had cleared, and we were delighted to see them. Our boys moved out of their large, dormitory-style room into our bus, parked outside, giving the Bateses a big room and bathrooms of their own. Our youngest children were deliriously happy to have some of their favorite friends to play with; all the older girls gathered comfortably in the kitchen to chat, cook, and bake, and the Bates and Duggar older boys went to work under Gil’s direction cleaning up the tree debris from our yard and at several other homes and businesses in our area as well. John-David and Josh had already used a rented backhoe to clear away some of the debris from our driveway, but Gil and his teenagers taught our older boys and Jim Bob a lot about how to safely trim standing trees. The rest of us watched in awe as they fearlessly climbed the tallest trees, tethered to a safety line, cutting and clearing damaged limbs as they moved about the treetops as easily as monkeys. Now, before we knew it, our yard was cleaned up, the dangerous tree limbs removed. The still-frozen hill in front of our house was perfect for sledding. Jim Bob retrieved a pile of old signs left over from his unsuccessful run for the U.S. Senate a few years earlier, and the children quickly transformed them into slick toboggans that skidded down the icy hill at lightning speed. Northwest Arkansas was still trapped in an ice locker, but at the Duggar home there was, as always, plenty of fun to be found. The power was still out and the Bateses were still with us when Grandpa Duggar’s seventy-third birthday rolled around on February 3. Grandpa felt well enough to be lifted out of his bed and onto one of our rolling office chairs for an appearance in the living room. Jana had baked his favorite banana cake and the kids had decorated the table with happy birthday banners and streamers. Prepare yellow cake as directed and bake. In a bowl, prepare pudding as directed on box. Pour pudding over cake. Slice bananas and lay slices on top of cake. Refrigerate until cold, about 1 hour. Serve and enjoy! There was lots of laughter but also lots of tears. We all knew this would be Grandpa’s last birthday, and although we were at peace, knowing he would happily spend the rest of eternity in heaven with Jesus, we also knew how much we would miss him as part of our daily lives here on earth. By then the tumor had taken away his ability to speak, smile, walk, stand, or move his arms, but we sensed his happiness to be among us, surrounded by the family he loved. With him seated at the head of the table as my mom fed him his birthday cake and ice cream, we were sadly aware that he was living his final days. And our children were watching it happen—and watching the way we responded to that sad, slow decline toward death. Grandpa’s last birthday was another momentous occasion for our family. The TLC film crew lined us all up in birth order—the Bateses and their sixteen children (Kelly was pregnant with their seventeenth), and the Duggars with our eighteen children plus daughter-in-law Anna. Michelle Duggar has been married for more than twenty years to her husband, Jim Bob, and they are blessed with nineteen children. The Duggars have the #1 program on TLC/Discovery Health/TLC documentaries and have appeared on national television shows, such as the Today show, Good Morning America, The View, Inside Edition, Jimmy Kimmel Live, and others. 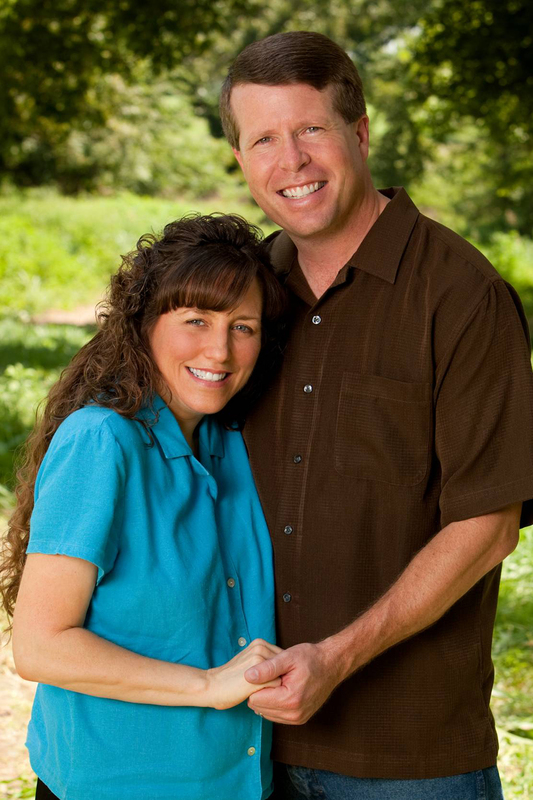 Jim Bob and Michelle Duggar married in 1984. Some time after the birth of their first child, they prayed that God would give them a love for children like his love for children and that he would bless them with as many children as he saw fit in his timing. Soon after, Michelle became pregnant with twins! The Duggars currently have ten boys and nine girls, and all their names begin with “J”—Joshua, Jana and John-David (twins), Jill, Jessa, Jinger, Joseph, Josiah, Joy-Anna, Jedidiah and Jeremiah (twins), Jason, James, Justin, Jackson, Johannah, Jennifer, Jordyn-Grace, and Josie. The Duggars are the #1 program on TLC/ Discovery Health / TLC documentaries and have appeared multiple times on national TV shows, such as The Today Show, Good Morning America, The View, Inside Edition, Jimmy Kimmel Live, Fox News Network, CNN, MSNBC, and others. Foreign television appearances include Italian Public Television, KBS (Korean Broadcasting System), and Discovery Home & Health (UK & Australia). They have been featured in magazine and newspaper articles in China, India, New Zealand, Australia, France, and Germany. As a family project, the Duggars built a seven-thousand-square-foot home. Both Jim Bob and Michelle are licensed real estate agents and conduct the Jim Sammon’s Financial Freedom Seminar in their community. They purpose to live completely debt-free—postponing purchases until they have the cash. Jim Bob served in the Arkansas House of Representatives from 1999 to 2003 and was a candidate for the U.S. Senate in 2002.